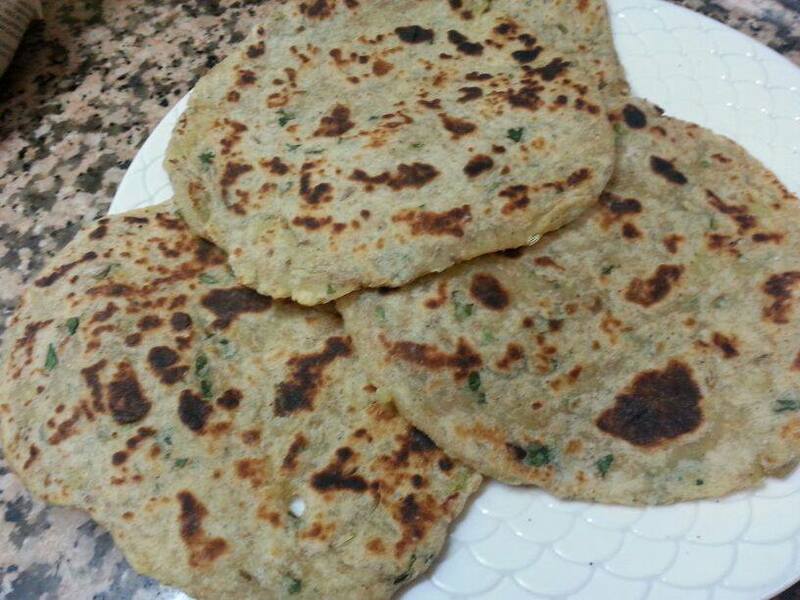 This desi flatbread is made with whole wheat flour with mashed boiled potatoes incorporated into the dough. The addition of herbs and fragrant spices gives it a wonderful flavour. Boil and mash the potatoes and while they are still hot add the flour, the spices, seasoning and herbs and make into a soft dough adding NO WATER , just a tablespoon of oil and the lemon juice. Knead well. Keep covered for half an hour. Make balls out of the dough, and flatten them. Heat a frying pan or iron gridle on medium heat, Roll out each ball of dough to a round disc and cook each one on the gridle till light brown and cooked. If you want them crispy brush with olive oil and cook till crispy. This tastes yummy with raita or pickle. Using olive oil makes this healthy. NITU DIDI TIP: If the dough gets too soggy just add some more whole wheat flour to it. You might need to use some more dry flour while rolling out the rotis. This entry was posted in Breakfast, Healthy Options. Bookmark the permalink.